This external battery management system(BMS) unit plugs directly into the 1S-8S JST-XH style balancing tap on your battery pack during discharge and notifies you when to stop running the pack via Low Voltage Alarm(LVA). Prolong your battery life by not allowing the voltage on your LiPo pack to drop too low. It can also be used to check the status of your battery at any time. This external BMS measures 40mm x 25mm x 11mm and weighs only 5 grams. Do NOT leave the unit plugged into your pack while not in use. 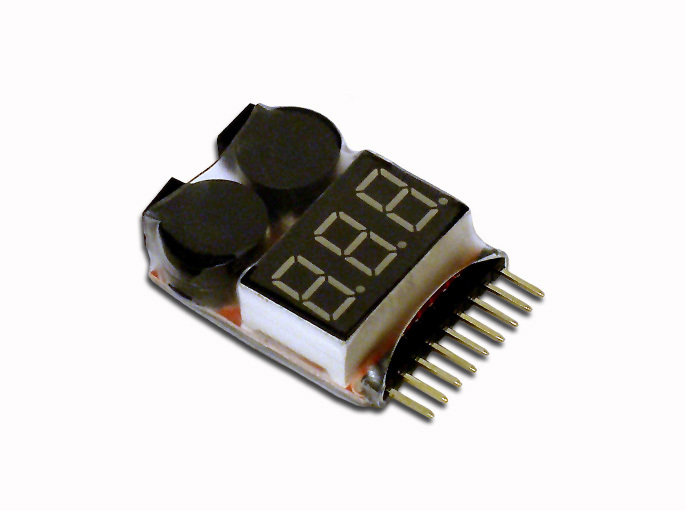 Can be used for a LiPo 3.7v(1-cell pack) up to a 29.6v(8-cell pack). Red LED will flash when a cell drops below programmed voltage setting(default is 3.3 volts but this can easily be changed to your preference by pressing the key button located near speakers). A loud audible alarm will also sound when a cell drops below programmed voltage setting. This is your indication to stop your vehicle in order to prevent over-discharging your LiPo battery pack. Unplug your battery pack from the speed control(ESC) and unplug the LVA from the battery pack. This item came with my recent order. Its simple and it works.